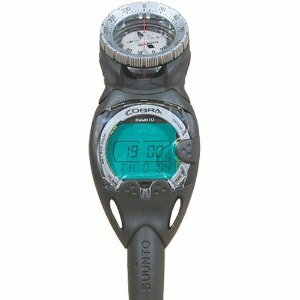 One of the most useful pieces of equipment a diver can have today is a Suunto Cobra Dive Computer with Compass. This device enables you to get a lot more out of your diving, especially if you are going on multiple dives a day since you can plan your dives beforehand and then be informed of your depth and be advised when to take safety stops whilst diving. Following each dive you can also discover much more information than you may have ever believed possible. A dive computer also allows for multi-level dives to become less complicated since it eliminates much of the need for complex dive table calculations as well as having to carry separate dive watches, depth gauges and of course a compass with you. The Suunto Cobra Dive Computer with Compass can do it all since it combines several different innovations into a single device. The watch can be used as both a dive planner and a dive simulator. Settings can be tailored to your own needs including personal adjustments and separate 3-step altitude settings. You can specify maximum depth and dive time for each dive to go on and the watch will sound an alarm if you go over these limits. Ability to adapt to a variety of different dive situations. The dive compass is an SK7 and as such is exceptionally accurate and regarded as one of the best in the industry. The Suunto Cobra Dive Computer with Compass is the only dive computer on the market that is air integrated and includes gauge modes, profile memory, air and nitrox. This allows it to display your remaining air time as well as cylinder pressure. Thanks to the profile memory, the Suunto Cobra will store the air consumption of a dive in its logbook so you can reference it in the future. Suunto dive computers have a reputation for being some of the best in the business and with all the bells and whistles included with the Suunto Cobra Dive Computer with compass, it is easy to see why. Speaking of bells and whistles, it may seem that Suunto dive computers are somewhat overloaded with features, but the great thing about it is even if you don’t use all of the features offered by the Suunto Cobra Dive Computer with compass right away, as you grow as a diver and continue to expand your skills and become more adventurous you will be glad that they are there, since it will grow with your needs. If you do choose to use this innovative device, you likely won’t need to purchase any additional instruments either because this will have you covered. The only problem really encountered with this, as well as other Suunto dive computers is that users have experienced problems uploading data from the device to their home computer, especially on Windows 7 machines. This may be something that you may want to look into further. You will however find that most Suunto dive computers do come with a warranty so should you find that you do have problems you will be able to return it. The Suunto Cobra Dive Computer with Compass is a full featured and detailed dive computer that will grow with you as a diver and allow you to keep expanding. It truly is a great investment with all of the features it offers you. You can purchase this item with complete confidence since Suunto dive computers are regarded as some of the best on the market and for good reason. Amazon are currently (at the time of writing) offering 25% off this dive computer – we recommend purchasing it before the deal changes. This entry was posted in Dive Computers, Reviews, Scuba Diving, Suunto and tagged Cobra, Dive Computer, Dive Equipment, Scuba Diving Equipment, Suunto. Bookmark the permalink.